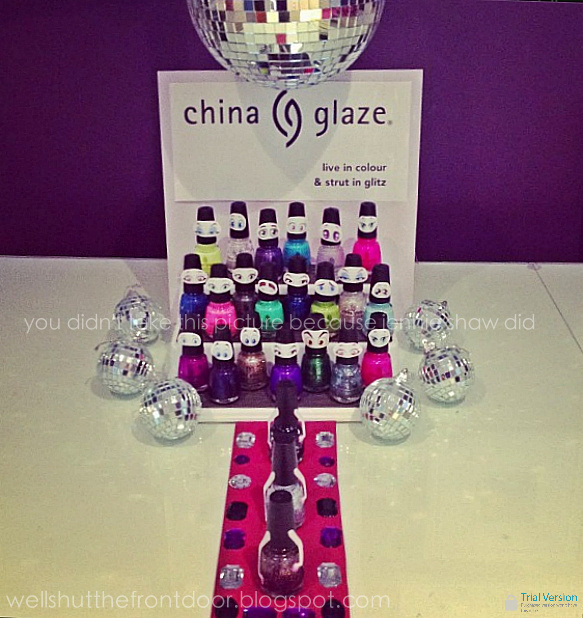 Over the last weekend, China Glaze had an Instagram competition where you could win the entire Glitz line. That's six, highly-sparkly polishes, people. SIX! At at seven bucks a pop, I was all...I'm legit gonna win this. So, I put on my thinking fedora and got to work coming up with a creative and original way to display my CG collection. The idea hit me in the head like a giant inflatable hammer--a fashion show! Needless to say, I thought I had it in the bag. I mean, I included their logo and slogan! But...I didn't! Adding insult to injury, instead of choosing three entires, they chose eight and I STILL wasn't one of them! With my devastated tail between my legs, I limped over to Sally's to get the two bottles of China Glaze Glitz that I'd had my eye on, only to find the most amazing thing! First, they actually still had them (I live in a smaller town so there was a chance they'd be sold out). But, more importantly, ORLY polish had decided to redo their bottles, which meant that there was an enormous cardboard box filled with their old bottles, right by the cash. "What's the deal with this?" I asked, fanning my hands over the box o polish. "We can't sell them invididicually because the bar codes won't scan anymore, so if you spend $3, you get a polish. And if you buy anything from our features, you also get a polish." And, lo and behold, there were cute Valentine's Day tweezers that were on sale for $0.99!! So, naturally, I bought four pairs, which meant that I got four bottles of perfectly awesome ORLY nail polish!! FIVE, in fact, as I got one with my CG purchase. Total cost for seven bottles of polish and four tweezers? NINETEEN dollars!! As disappointed as I was not to win the contest, I really only liked two of the Glitz colours and if I wasn't a big fat China Glaze Creative Contest Loser, I wouldn't have gone into Sally's to see this awesome deal! Talk about a colourful lining! Hahaha, at least they are cute tweezers! Can't wait to see what you do with the polishes! Bummer about you not winning. you had a great idea. YOU WERE ROBBED!!!! Obviously they got confused and didn't understand your creative genius. On your part this was totally genius because I am always forgetting where I left my tweezers and could totally use four pairs!